Guys, I need some help identifying the differences between the axles for these. 1992 ST185 Japan Carlos Sainz edition axles I bought have much larger inner spline then what I was expecting, so maybe that had something different going on?! From what I can find, ST165 to ST185 axles are the same, ST205 went away from 6 bolt flange, still works in older trans but is longer than gen1/2 axles. You're talking about the end that goes into the diff/trans? Looking them up for my RC the part number for the inner assemblies are the same for all 165's, all 185's, and the SV25 Camry. Yes, that's what I'm talking about. How about st205? Does anyone have pictures of these parts? Thats' what I need. EDIT: I've been told the LH axle that I got doesn't look like an ST185 axle, but he's also out of Europe and has a st185 RC. What I have found is the Japanese ST185 had a different transmission, but did it have a different diff set-up than everywhere else and that's why the axle inner flange is different?? 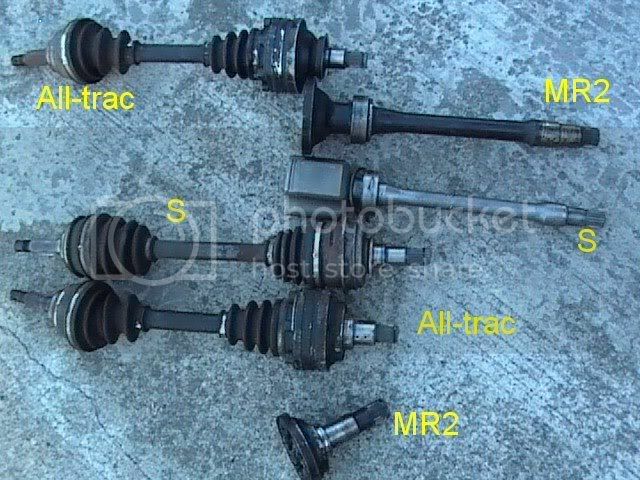 Here's st205 axles from northwest jdm motors website. Ok, I think the difference in axles may be due to a front TRD limited slip. Anyone have any information regarding JDM options? What came with a front LSD? Nothing came with front LSD. TRD LSD had to be purchased separatly and installed. Anyone have images of TRD front LSD? This thread used to have them, but the pics arent working anymore. Ok, after running through this thread, it looks like it might be that someone tried putting an MR2 LSD into an all trac trans maybe. the ends look the same. ah ef. it doesn't have the same spline length that the shaft I have does.... looks pretty similar in OD though. EDIT: ALL I NEED ARE PICTURES OF ST165 or ST185 STUB AXLES THAT GO INTO THE TRANSMISSION.